Some people keep the rosary revolving in their hands but their minds roam in the market. Can this be called japa (chanting)? While meditating, both your body and mind should be steady! The body is made of five elements, so it is bound to suffer. You should not be affected by it. This is true sadhana (spiritual exercise). All other sadhanas will prove futile if you do not give up body attachment. Today marks the beginning of a very sacred year. Not only in this year, but throughout your life, you should cultivate sacred thoughts. 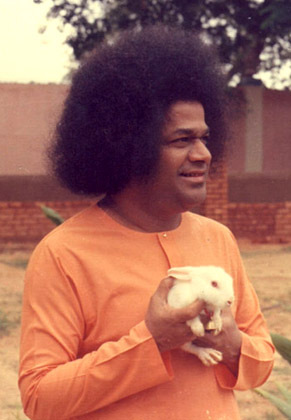 Embodiments of love, develop more and more love in you. Experience love and share it with others. You are not merely mortals. You are the sparks of divine. Lead your life in such a manner. This is the most important message for this New Year! When you understand and internalise your divine origin, your thoughts, words, and deeds will become sacred!